Published by D.A.P./Distributed Art Publishers, Inc. 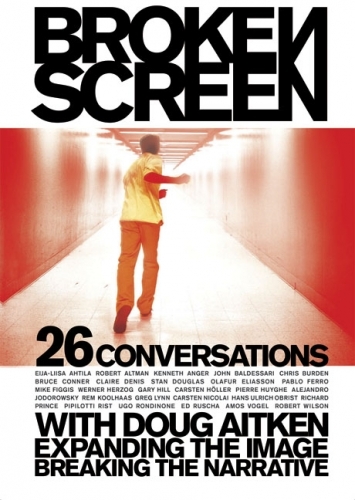 Broken Screen is comprised of informal conversations between artist Doug Aitken and a roster of 26 carefully chosen artists, filmmakers, designers and architects. Part guidebook and part manifesto, the book takes a fresh look at what it's like to create work in a world that has become increasingly fragmentary. Through casual and direct discussions Broken Screen offers a detailed navigation through the ideas behind the important yet under-documented visual language of nonlinear narratives, split screens and fragmentary visual planes that define the most progressive moving images today. Presented in 26 illustrated chapters, the focus here lies on the shattering of the linear narrative in the visual arts through the use of image-based work to articulate the speed and fragmentation of modern life. Perhaps best of all, Broken Screen is a unique opportunity for readers to learn the thoughts and personal beliefs of these artists in their own words and imagery, unencumbered by critical or commercial filters, and communicated in the manner of a conversation between friends. It also seeks to produce a cultural manifesto for new communication, expression and understanding in both the present and future--much as Marshall McLuhan's Medium is the Massage did. With its accessible conversational style, forward-thinking graphic design and over 300 high-contrast images, Broken Screenextends across many disciplines including art, film, design and architecture, and is sure to become an important document of our time. Aitken's 26 interviewees are Eija-Liisa Ahtila, Robert Altman, Kenneth Anger, John Baldessari, Matthew Barney, Chris Burden, Bruce Conner, Claire Denis, Stan Douglas, Olafur Eliasson, Pablo Ferro, Mike Figgis, Werner Herzog, Gary Hill, Carsten Höller, Pierre Huyghe, Alejandro Jodorowsky, Rem Koolhaas, Greg Lynn, Carsten Nicolai, Richard Prince, Pipilotti Rist, Ugo Rondinone, Ed Ruscha, Hans-Ulrich Obrist, Robert Wilson and Amos Vogel.